Oxygen bleach is a versatile cleaning staple that is a safer, more environmentally friendly alternative to chlorine bleach. Oxygen bleach is a powder that is activated by water, causing it to release oxygen and have great cleaning power. It can be safely used almost any instance chlorine bleach is used ​but without the toxic fumes and substantial negative environmental effects. One important thing to note about oxygen beach is that the chemical reaction that causes it to release oxygen, and work its magic, takes longer to get the job done than standard bleach does—so be prepared to let things sit for a while to achieve the best results. Once mixed with water, oxygen bleach should be used right away. Don't attempt to store it in a sealed container for later use as the oxygen released by the chemical reaction may cause the container to explode—leaving you with another mess to clean up, or worse. Perhaps the most popular and well-known use; simply add a bit of oxygen bleach to every load of laundry to leave your colors brighter! Amount needed may differ by the company you purchase it from, so be sure to read the directions and suggested usage first. Many companies include a perfectly sized scoop to make this simple for you. Presoak your laundry for tough stains or to brighten dingy whites. Add oxygen bleach to your top loading washing machine or to a basin and then add hot water. Once the oxygen bleach is fully dissolved, add your linens and laundry and let sit at least 6 hours to overnight. Then launder as usual. Some fabric items may not be washable with oxygen bleach. Check the directions on the package. If you'd like to kick the stain removing power up a notch—line dry your item in the sun. You'll be truly amazed by the results! 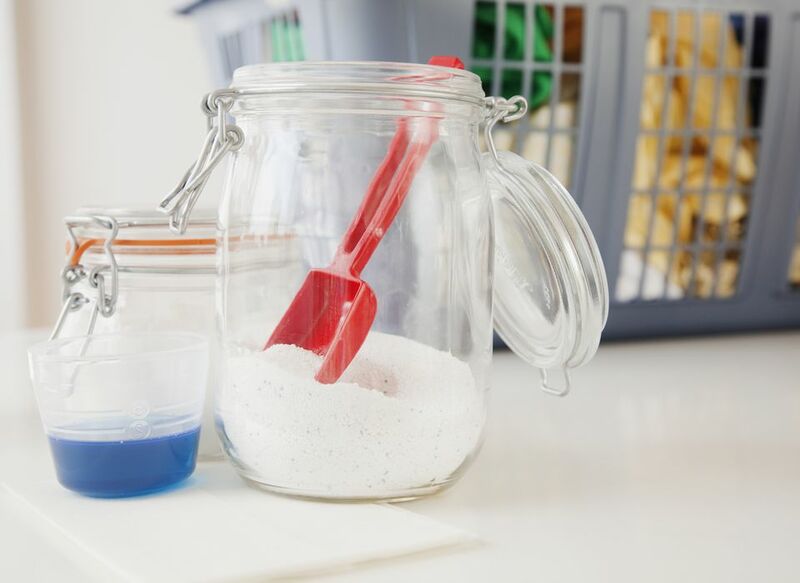 For stained plastic ware, including bottles, coffee pots, dishes, cutting boards, and enamel sinks, add 2 to 4 tablespoons of oxygen bleach to the container to be cleaned and soak for at least 15 minutes. Rinse and wash as usual. To eliminate mold, mildew, and other organic stains from your refrigerator interior, add 4 tablespoons of oxygen bleach to 4 cups of water and apply this solution with a soft cleaning cloth. Let sit for 10 to 12 minutes, wipe, and rinse! This is a fun and simple tip! Dissolve 2 tablespoons of oxygen bleach in 1 cup of hot water and simply pour down your drains once a month to help clean and freshen. Allow the mixture to sit in the drains overnight for maximum cleaning power. For cleaner, fresher toilets add a few tablespoons of oxygen bleach, wait 15 minutes then scrub away. For porcelain sinks, bathtubs, and showers, make a paste by mixing oxygen bleach and just a bit of hot water together. Apply the mixture to the surface and let it sit for 20 minutes, then scrub and rinse away well. To help remove mold from your shower curtains, soak the curtain in 2 tablespoons of oxygen bleach per gallon of hot water. It's best to allow the curtain to soak overnight. Follow up by hanging to dry in the sun for a boost. Mix 2 to 4 tablespoons of oxygen bleach with a few cups of hot water and use the mixture to wipe out the pale interior. Rinse well, wipe down, and let the pail fully dry before adding diapers again. Lawn furniture can be such a challenge. To help lighten stains and brighten up finishes and upholstery, create a mixture of 2 tablespoons of oxygen bleach to a cup hot water (less if you need a paste) and get to scrubbing. Allow to sit for 15 minutes and then rinse thoroughly. Yes, even your cleaning tools need to be cleaned...actually, especially your cleaning tools! They do some seriously dirty work and can be harbors for germs. For mops, dingy dishrags, and shop towels add 6 tablespoons of oxygen bleach to a gallon of hot water, soak overnight, rinse, dry, and they'll be ready for action! Look At These Home Recycling Bins. They Look Great! What Is a Permaculture Garden and How Do I Start One?